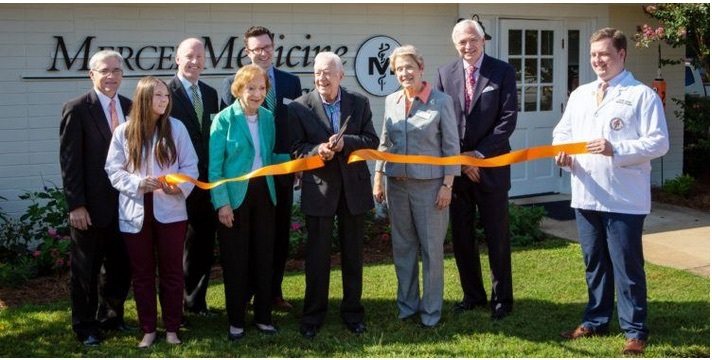 Representatives from Mercer University and the city of Plains gathered with former U.S. President Jimmy Carter and former First Lady Rosalynn Carter on Wednesday to celebrate the grand opening of Mercer Medicine Plains. The primary care practice and division of the faculty practice of Mercer University School of Medicine has been accepting patients at 107 Main St. in downtown Plains since July, and the clinic’s schedule of appointments is currently near capacity through October. “The fundamental premise behind this clinic is that folks in rural Georgia put food on our table. They’re the backbone of our state, and they deserve the same access to quality health care as everyone else in the state of Georgia. That’s the mission of our medical school, and this clinic in Plains represents part of a broad-ranging initiative by the University to transform access to health care in this state,” said Mercer President William D. Underwood. Mercer Medicine Plains offers comprehensive primary care services using local physicians and nurse practitioners, as well as specialty care and mental health services through both in-person and telehealth consultation. Care is available Monday through Friday, with a call service to provide coverage in the evenings and on weekends. On-site services include primary care, internal medicine, OB/GYN, marriage and family therapy and counseling, lab and X-ray. Telemedicine technology, supported by the Georgia Partnership for Telehealth, will provide additional access to cardiologists, pulmonologists, endocrinologists and all other specialists offered at Mercer Medicine in Macon. Michael Raines, M.D., provides family care, along with nurse practitioner Betty Jo Songer, FNP. The providers are supported by three clinical staff, a radiologist and a medical receptionist. The clinic, which was refurbished by Mercer using local contractors, has a total of four exam rooms, on-site X-ray and will soon begin offering echocardiograms and ultrasound services. Landscaping includes a butterfly garden that is part of the Rosalynn Carter Butterfly Trail, an effort by the former First Lady to inspire the planting of flowers and milkweed to promote the return and migration of the threatened Monarch butterfly population in North America. Upon the closing of the Plains Medical Center in March, residents were without an option for local health care. President Carter, who is a Life Trustee at Mercer, and Mrs. Carter hosted Dr. Sumner and MUSM representatives in late May to discuss plans to bring a medical clinic back to Plains and to demonstrate the ability to perform a medical examination at a distance using technology. School of Medicine faculty will participate in provision of care in the community, and the medical school will also offer a rural rotation for its students in Plains so that they can gain the skills needed to practice in a rural community and an appreciation of the benefit health care brings to rural patients and towns. MUSM’s Department of Community Medicine is in the process of conducting a community health assessment, led by Gary Dent, M.D., with assistance from Brad Lian, Ph.D., to inform operations of the clinic. In keeping with its mission to meet the primary care and healthcare needs of rural and medically underserved areas of Georgia, the School of Medicine intends for the Plains clinic to serve as a pilot for future rural primary care clinics. Mercer’s Georgia Baptist College of Nursing will add two dedicated family nurse practitioner student rotations at the clinic to work alongside other nurse practitioners and members of the healthcare team. The University’s College of Pharmacy has added two rotations for Doctor of Pharmacy students at the Plains Pharmacy to complement the work of the School of Medicine. Additionally, Mercer’s College of Health Professions, which educates physical therapists, physician assistants, public health professionals, clinical psychologists and athletic trainers, plans to participate in care, research and training at the clinic.